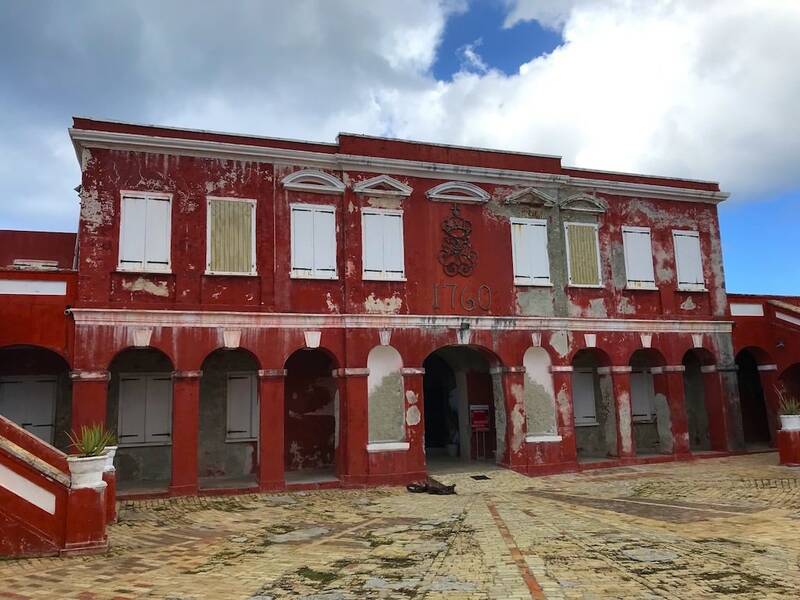 7 Spectacular Things You Need To Do In St. Croix - Ambassadors of World Food Tourism. My trip was hosted by the United States Virgin Islands Tourism. All suggestions and endorsements are solely personal. Our policy is only to share and recommend honest and fair reviews of what we personally like and have experienced. 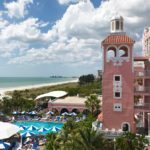 When you are a Midwesterner you may dream of visiting the Caribbean Islands as the weather starts to turn a bit cooler. When I woke up this morning to Wisconsin temperatures in the mid 30s my mind couldn’t help but wander to St. Croix, USVI. I fondly remember my visit there not just because of the warm climate, lapping waves and relaxed culture. I remember it most for the people. St. Croix’s people are hard working, resilient island people yet they know how to relax, go with the flow. They welcome those who visit to do the same. 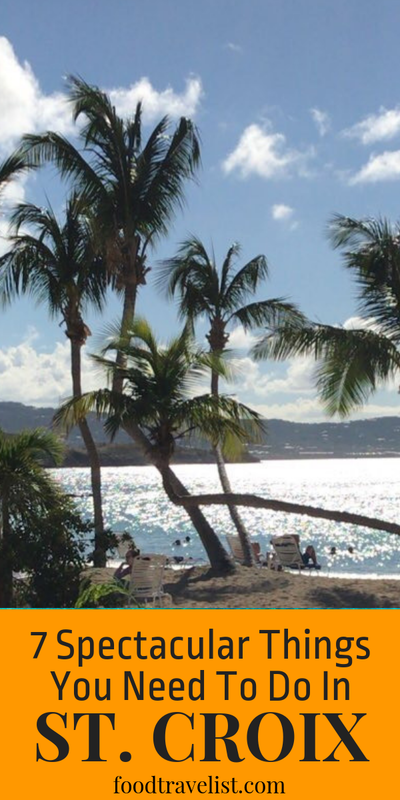 If you live in the United States, St. Croix is just a short plane ride away to paradise. Whether you’re seeking a visit loaded with water sports, golfing, horseback riding or you just want to lounge on the beach sucking up fruity cocktails and finding gourmet dinners fit for a king, St. Croix has you covered. 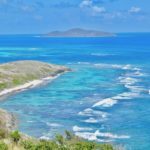 There’s so much to explore in fact that they even publish 100 things to do in St. Croix for those of us who love a list and love to check things off that list just as much. My list will be much shorter. 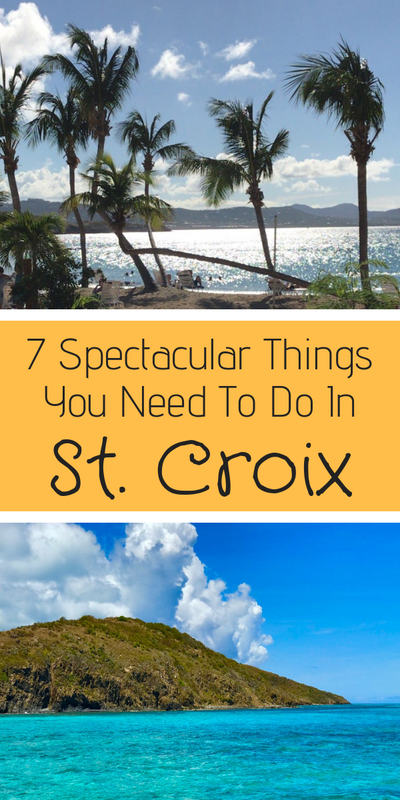 I’d like to introduce you to my 7 Spectacular Things You Need to Do in St. Croix. These are all not to miss items and when you visit be sure not to hurry through any of them. Linger, taste, savor the Crusian history and culture and let St. Croix welcome you. If you’re going to the Caribbean the beach has to be one of the first things on your agenda. We have friends who, as soon as they land, run to the beach. That can’t wait to feel the sand in between their toes and the suns warmth on their face. 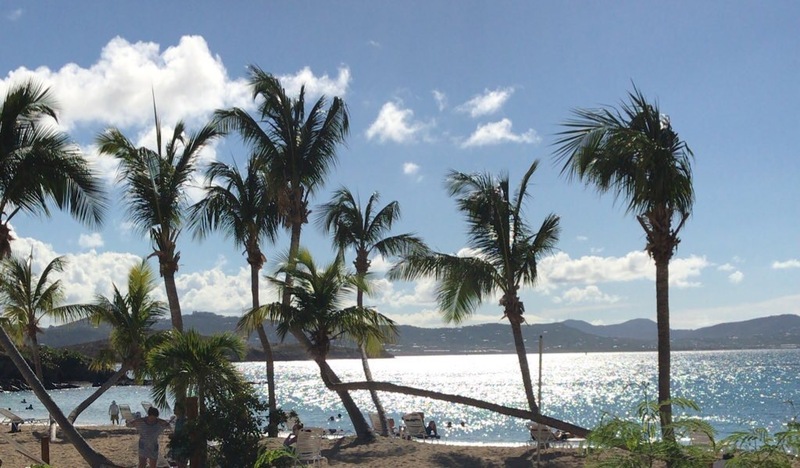 When you go to St. Croix you will be able to find beaches with many things to do like the beach at the Buccaneer Resort where you can take part in just about any beach activity that suits your mood. Or head to Shoys beach on the East End of St. Croix, where many locals go to relax. You won’t find lifeguards or beach toys but you will have to weave your way through seagrape teas and other brush to get to the much more secluded and quiet beach. It’s great for a swim or a peaceful long walk. It might come as a surprise that there is a “rainforest” on the island of St. Croix. It’s a lovely drive into this area of lush region full of mahogany trees, ferns, fruits and more. It’s a wonderful area for hikers, birders and lovers of nature. 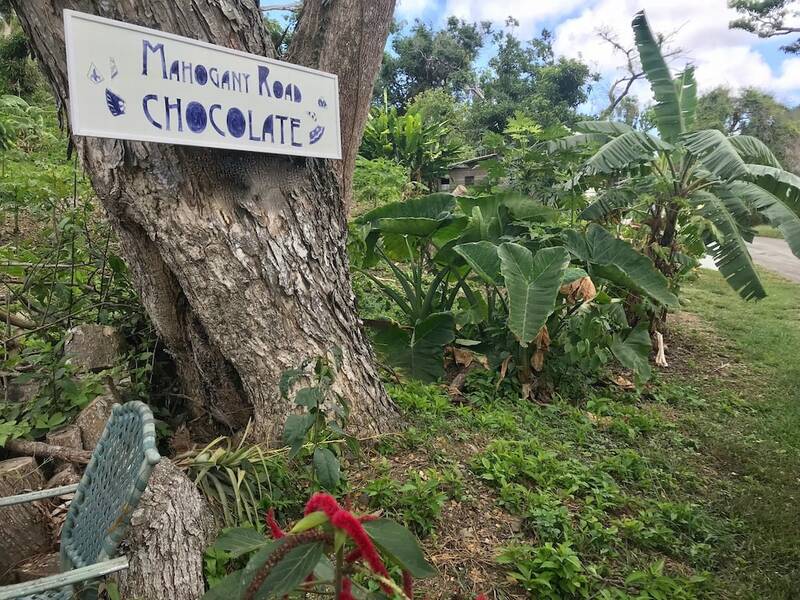 Be sure to stop along the way at the Mahogany Road Chocolate shop with its small batch “bean to bar” handcrafted chocolates or Nidulari Bakery right next down the road in a black and red cart. The hours vary so be sure to check before heading out. Although I didn’t experience them myself, I’ve heard there are also some beer drinking (non-alcoholic) pigs that entertain the customers at the Mt. Pellier Domino Club on Mahogany Road. Many travelers and locals stop in for a beer or a shot of their housemade infused-rum the Mama-Wanna and grab a beer for the pigs. The pigs acquired the taste of beer and now jump up and get really excited for their brews. I’m sure it’s a sight to see. St. Croix may be the home of Cruzan and Captain Morgan Rum but don’t leave the island with just their tasty rum. Take your time and stroll through the many shops and galleries you’ll find. There’s no better way to support the island economy and help speed recovery from the hurricanes than spending your hard earned dollars. One unique souvenir is the St. Croix Hook Bracelet. While the folklore around these thin bracelets with hooks for clasps varies from island to island you will certainly be able to tell your own unique story. Using the folklore about luck and love based on whether the hook points toward or away from your heart)you can share your favorite version of its meaning to all your friends when you get home. There are also many galleries and specialty shops to browse and wander through. Be sure to stop in the Mitchell Larson Studios in Christiansted. 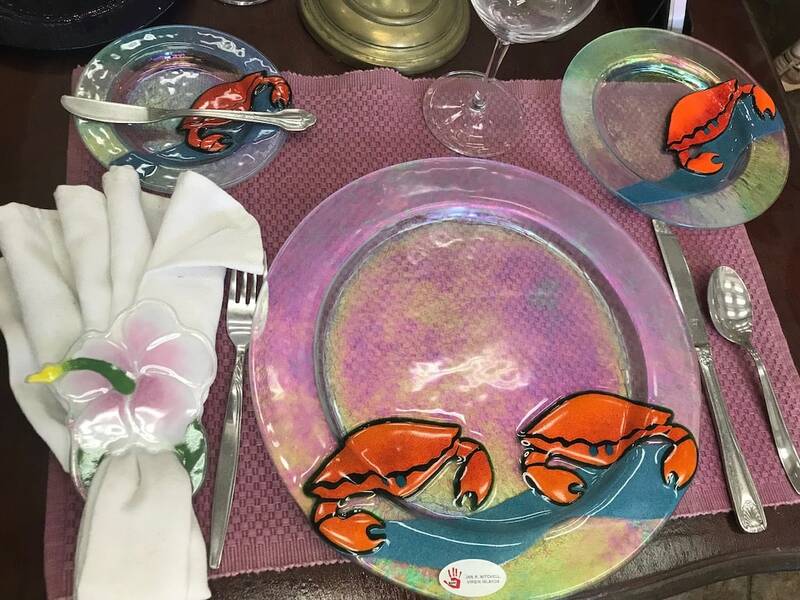 The gallery is full of interesting glass art pieces, from plates and glasses to holiday ornaments. If you see something you like but want something just a bit different they also customize their work as well. Enjoying the beauty and wonder of nature is certainly one of the reasons we like to explore the world. 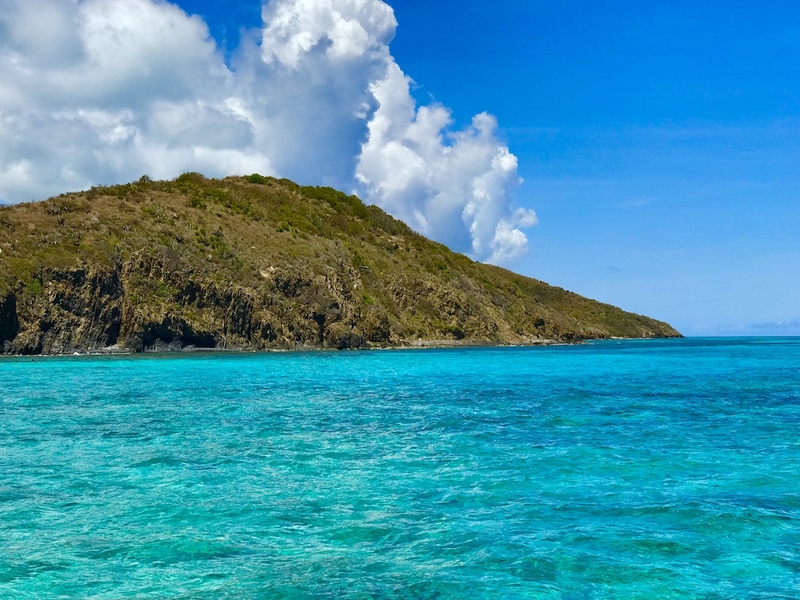 A special place to enjoy nature in St. Croix is nearby Buck Island. 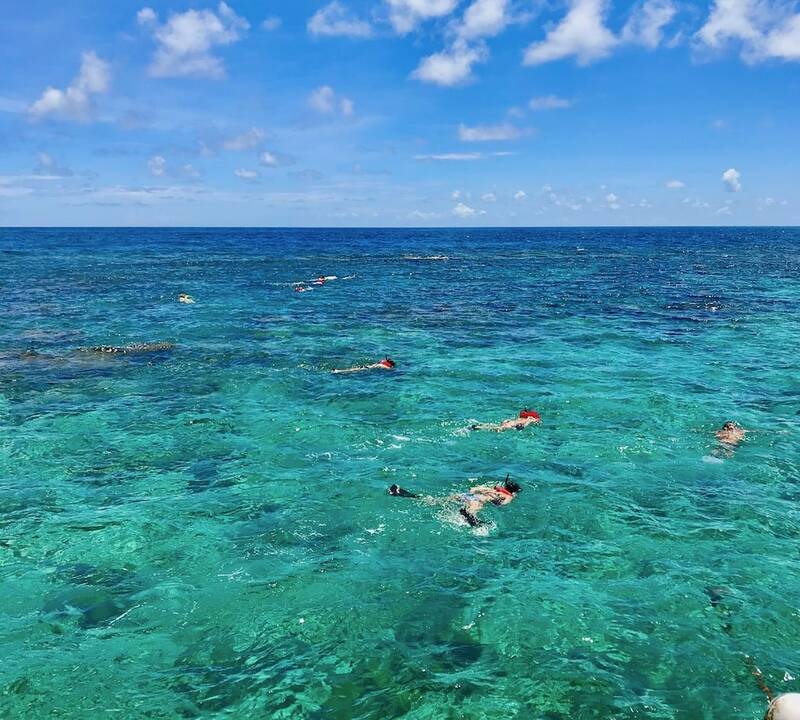 There you can snorkel along the Buck Island Reef National Monument. We spent the morning with Big Beard’s Adventure Tours. They started the tour by picking us up on the dock at our hotel the Buccaneer Resort. We then took a short cruise to Buck Island. Before heading to the reef we were able to stop at the island and get a quick course in snorkeling. I had snorkeled before but it had been many years. I have to admit I was a little nervous. Much to my surprise and delight, our guide gently told us how to don our gear and then we got into the water where she showed us what to do and what to expect. This may seem simple or basic to those who have snorkeled a ton but unfortunately, I had a bad experience years ago and, although I’ve snorkeled since then, I still get apprehensive every time I try again. Human nature I guess. We walked into the water and as our teacher came around I began to feel very comfortable in the water and with my gear. I snorkeled off the beach started to see some fish and sea life and could feel myself smiling under the water wishing Diana was with me. I know she would have just loved this experience. After a few minutes, the teacher came over and said I don’t know what you were worried about you’re a pro! That comment sent my snorkeling confidence through the roof. What a great instructor. We then got back in the boat and headed to the reef on the other side of the island. On the way we were warned to stay with the group once out of the boat and not to touch anything. The reef is a living breathing creature. Touching it can not only hurt you by cutting you, scraping your skin or even causing an allergic reaction but it also destroys the reef. As we got into the water I was super excited to see all the sea life. If you’ve never snorkeled or scuba dived, seeing these creatures up close is a privilege and truly awe-inspiring. Our guides led us through the path on the reef slowly, pointing out lots of fish and plant life along the way. On the way back to the hotel we sipped on rum drinks celebrating our wonderful and memorable excursion. 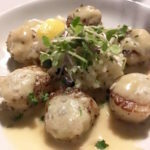 If you read my post 10 Yummy Spots in St. Croix That Will Make You Never Want To Leave you know there is an almost endless supply of good food and drink on this island. 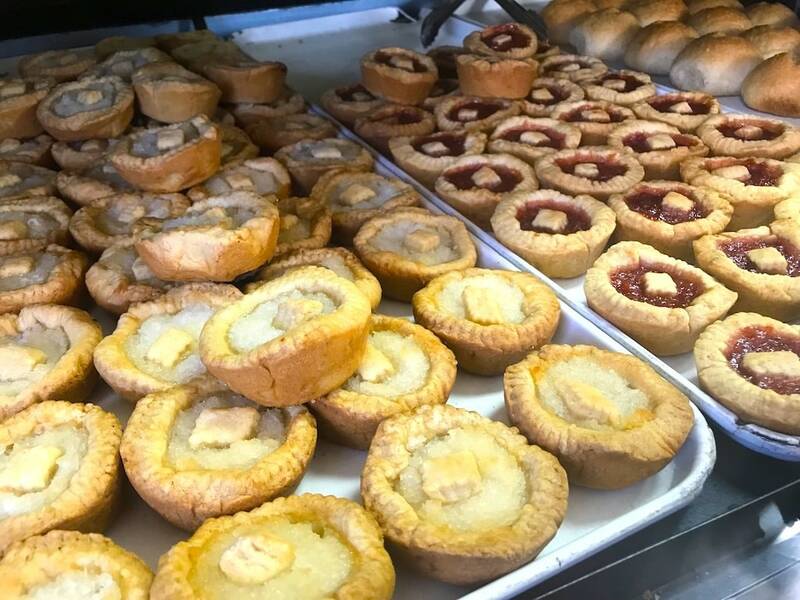 From morning to night you can find fresh pastries, fresh local seafood, with choices from fine dining restaurants to road-side shacks. I would urge you to take your time, order a second drink, stop often and meet the people preparing these local foods. Each one has a wonderfully unique story tell. You’ll find the people so warm and embracing. It’s almost guaranteed that when you leave you will have the names of at least half a dozen locals who are now your “cousins.” They will welcome you and welcome you back time and time again. You can find a deep dive into the history and culture of St. Croix with Crucian Heritage and Nature Tourism (CHANT). 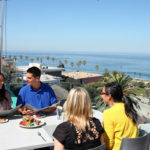 They offer tours on historical architecture, arts and crafts, and nature and agriculture. 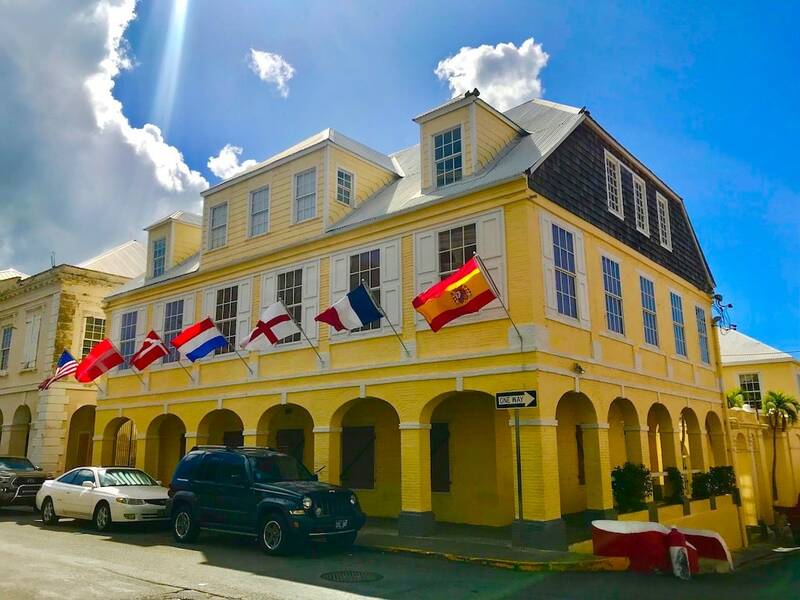 A walking tour through the charming town of Christiansted leads you through Fort Frederik, Victorian townhouses and historic churches. There’s also an Alexander Hamilton Historical Walking Tour that follows his childhood footsteps in St. Croix. If you love gardens be sure to visit the St. George Village Botanical Garden. Although it did have quite a bit of damage after the hurricanes it still houses so many beautiful plant species native to St. Croix. 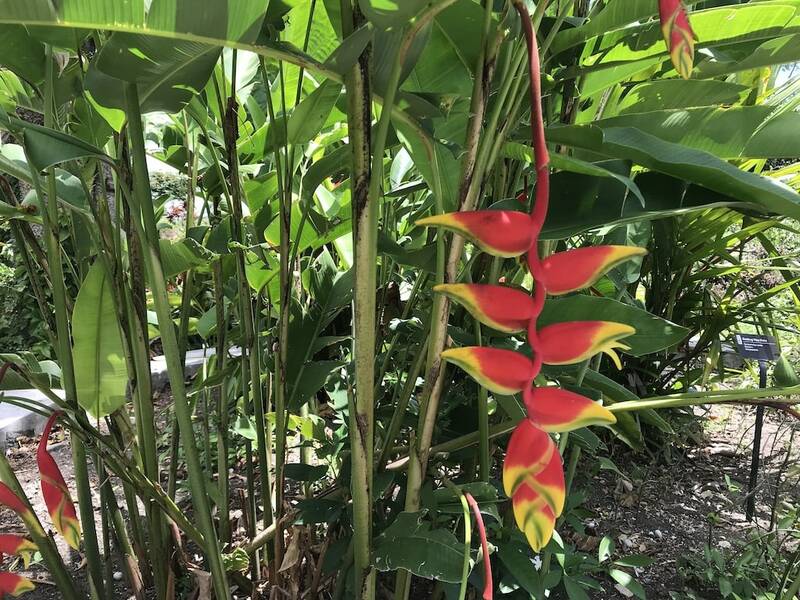 The garden works to teach visitors about conservation and preservation of the impressive collection of over 1500 native and exotic species they have assembled on their grounds. A what? This by far is the most unique and fun thing to do in St. Croix. When the sun goes down and you’re driving around, you’ll notice people congregating at gas stations. Some have full bars set up, some don’t. Some have food, some don’t. What they all have is an impromptu “popup” place for people to meet and have a good time. There will be music, maybe dancing and again you will find yourself meeting a local or two. The best way to find one of these local gatherings is to keep your eyes open when you’re driving around. Stop in and be sure to designate a driver. 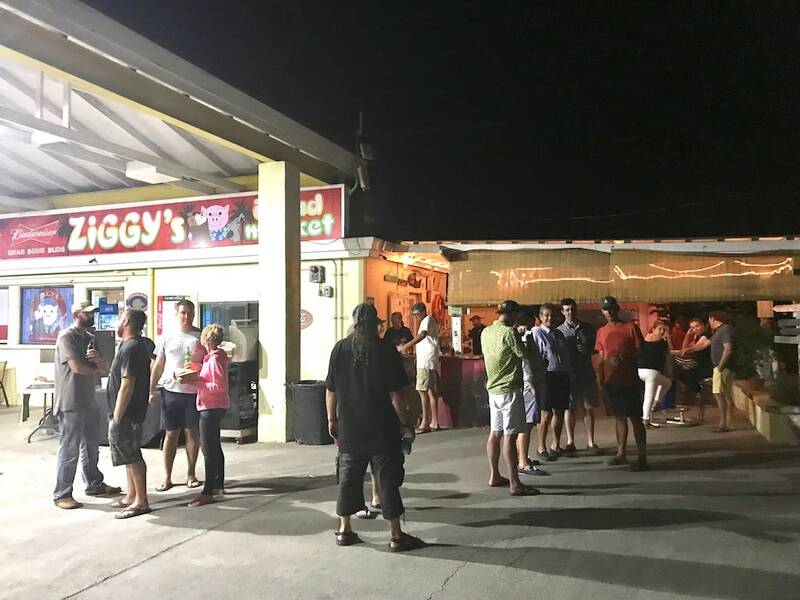 Party goes all night at the gas stations in St. Croix. As you see one thing can lead to so many other things to do in St. Croix. This island is sure to welcome you no matter what you’re looking for in an island escape. Go to relax, go to play, go to eat and drink. The most important thing of all is to go. Happy to add them on your radar. Hope you get to visit soon. Have not been to St Croix. Wish I were there now! I want to swim in that water. The color looks amazing. Like you, I come from a place that is cold in winter and far from the tropics. 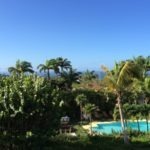 Loved your post about St. Croix. Wish I was there right now! St. Croix’s aquamarine waters sure look appealing in this “gray season” in New York. I’ve been to St. Thomas and St. John but not St. Croix. Looks great, especially the snorkeling at Buck Island beach, and the gas station parties are a hoot! Great article. We have never visited St. Croix, but it’s on our list. I would want to spend time on the lovely beaches, but may take a moment to try some of that special rum. Might as well watch the pigs squeal with joy for a beer, as well. The Buck Island beach is magnificent. One of my favorites. Hi Sue, some great ideas about what to do in St Croix. The snorkelling looks amazing, beautiful water – and the fresh local seafood (and those lovely fruit tarts) would appeal to me too.